The sixth Lancaster Jazz Festival is almost here! The sixth Lancaster Jazz Festival is less than a week away and organisers say it’s their most ambitious yet. The festival runs from Friday 16 September until Sunday 18 September in various locations across Lancaster. This year’s headline act, Cath Roberts, will perform as part of a 10 piece ensemble at The Dukes on Saturday 17 September, with a specially commissioned, brand new piece of work. All the events during the festival are free to attend, with the exception of the Cath Roberts gig. Tickets for the headline show range from £5 to £20 and are available from the box office at The Dukes by calling 01524 598500 or they can be booked online at www.dukes-lancaster.org. The three day festival opens in style at Lancaster Brewery with the Lancaster Royal Grammar School Big Band performing at 7.45pm on Friday 16 September. The band will be joined for this special one-off set by saxophonist Phil Meadows. 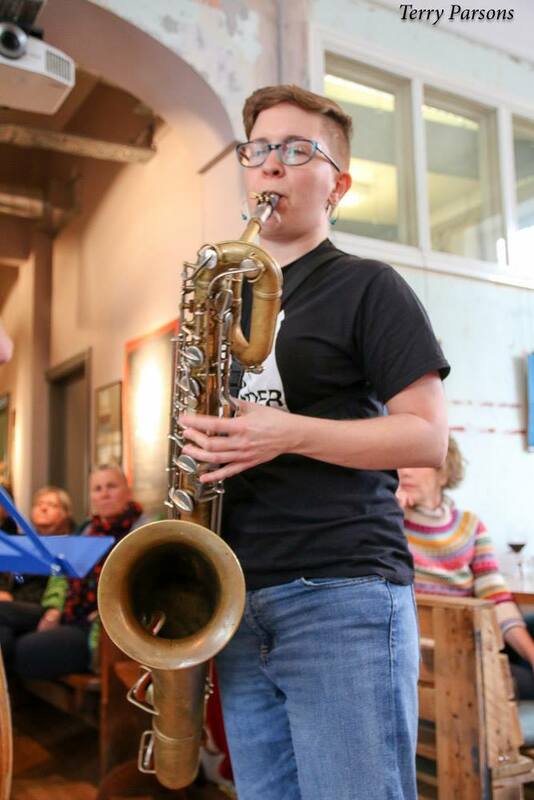 Meadows is a London based session musician, artistic director of Engines Orchestra and until recently was the lead alto sax player for the National Youth Jazz Orchestra. That performance will be followed by Entropi, a five-piece outfit known for juggling order and chaos with sets blending composition and improvisation, before London based, powerhouse trio Skint close the evening with heavy beats, big riffs and fiery improvisation. Saturday 17 September will see acts split across two venues during the day, with performances outdoors at Sun Square, Sun Street and across the road at The Hall, China Street running concurrently. The line-up in The Hall includes the Lancaster Jazz Festival Youth Jazz Commission, which this year was awarded to up and coming guitarist Billy Marrows who will perform a brand new piece of work, as part of his Royal Academy of Music based contemporary jazz octet. Joining Marrows in the Saturday line-up in The Hall are Nodha, featuring last year’s Youth Jazz Commission artist Calum Macleod, as well as the Newcastle based Trio FCT who close the day at the venue. Sun Square will host four performances on the Saturday including crowd favourites Let Spin, as well as the truly original Craig Scott’s Lobotomy, a sextet capable of pulling apart live improvisations and putting them back together with the use of digital technology. There will also be a performance from the new Jazz North Introduces band Wandering Monster, a five-piece up and coming group from Leeds who will perform at 1.20pm. For music lovers, the day’s performances build nicely to the headline act at 7.45pm in The Round at The Dukes. Cath Roberts’ specially commissioned work will be performed by her 10 piece band comprising musicians from right across Europe. Roberts is one of the most exciting saxophonists, composers and large ensemble leaders in the UK and this specially curated, acoustic set will range across diverse musical territories. In addition to her headline slot, Roberts is also this year’s Artist in Residence and will be popping up at various events during the festival, including a Q and A at 6pm ahead of the Saturday showpiece. The final day of the festival again sees acts split between Sun Square and The Hall, with performances running from around midday until 5pm. The Zoe Gilby Quartet will open the day on the outdoor stage at 12.20pm and they’ll be followed by Archipelago, with the Johnny Hunter Quartet closing the stage from 3pm. The Hall’s performances will begin at 1pm with Lancaster based cellist Maja Bugge followed by the James Beckwith Trio at 2.15pm. The final act of the festival, Ripsaw Catfish, starring Cath Roberts, will bring the weekend to a close with their set from 3.45-4.45pm. The full line up for Lancaster Jazz Festival 2016 can be found at www.lancasterjazz.com. To book tickets for the headline performance visit www.dukes-lancaster.org or call 01524 598500.